Burnley FC Women claimed their first point in the FA WNL Division 1 North at the Arbories on Sunday. And it would have been all three but for a late Leeds United equaliser. After controlling much of the game, the Clarets found themselves disappointed and hanging on to retain a point with a 1-1 draw at the final whistle. Heavy rain prior to kick-off raised concerns that the match could be called off, but a pitch inspection revealed a firm playing surface. Leeds United Ladies quickly tested the Clarets defence, as they opened the game attacking down the slope. The Clarets responded when youngster Natalie Bell, playing her first game for the Clarets in three years, crossed to the head of Evie Priestley, whose effort ran wide. The Clarets maintained the pressure, and Bell was well positioned when she received close to goal, though her shot lacked power and was wide of the mark. A shot from Sarah Greenhalgh flew high above the bar and into the cricket ground before a series of quick passes set Leah Embley off on goal, where she shot forcing a diving save from the keeper. Justine Wallace was awarded a free kick from 25 yards following a late challenge from a defender. She struck at goal, and the visitors were lucky to stay on level terms as they watched the shot hit the bar. The Clarets continued to press at goal, though the game was becoming more even. A Leeds United free kick was awarded at the side of the 18-yard box, and a direct shot was taken at goal, and the ball bounced off the outside of the post. After the change around, the Clarets had the advantage of the slope, but the game remained evenly balanced until smart interplay between Evie Priestley, Lynette Craig and Vikki Eastwood provided a cross that was met by Greenhalgh, who headed into the net. Both teams pushed forward in attempts to open up chances, but it was the Clarets who came closest at the midpoint of the half. A Lynette Craig corner located Greenhalgh, who forced a reaction save from a lunging header that led to another corner. This culminated in a goal mouth scramble and a third corner that was cleared to the frustration to the Clarets. 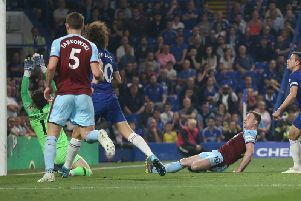 The Clarets pushed forward with the hope of extending the lead., but their efforts were quashed with 11 minutes remaining, when the visitors launched a breakaway attack where an untracked striker received the ball on the wing and drove towards goal at speed and slotted past Bracewell to level the score. In the final stages, the visitors turned tables and picked up the momentum, forcing the Clarets to defend for much of the remaining time. The game remained 1-1 at the final whistle. On Sunday Burnley FC Women are in League Cup action against West Bromwich Albion Ladies at Boldmere St Michaels FC, Sutton Coldfield, kick-off 2-30 p.m.